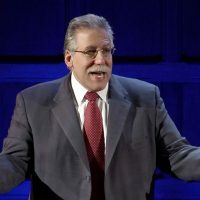 (Pulpit & Pen) Michael Brown recently said that Hank Hanegraaff – who left Christianity for the idolatry and heretical doctrines of the Eastern Orthodox Church – still affirmed all the “fundamentals” of the Christian religion. Perhaps being a scholar in Hebrew doesn’t exactly equate to an educated opinion on interfaith apologetics, but Eastern Orthodoxy, in case you didn’t know, denies Penal Substitution, Sola Fide, Sola Scriptura, and promotes things like the veneration of Mary, Saints, and icons. This apparent inability to recognize what is and is not authentic Christianity didn’t stop James White at Elephant Room 3 from bringing on Michael Brown to discuss together why he (and according to Brown, charismatics like Heidi Baker and Bill Johnson) are orthodox (lower-case “o”) believers. The accusation from White and Brown is that we should be able to embrace the good in someone while yet acknowledging the bad. Nevermind, of course, that Michael Brown never himself elaborates upon the bad of hyper-charismatics and for James, hyper-charismatics are not bad enough that we should not give them a boost in propagating their material or reputation as Christian teachers (at least when it comes to Brown). Both Brown and White plead ignorance when it comes to what the most infamous charismatic charlatans believe. On the Elephant Room 3 episode of the Dividing Line, White said he was unaware of the teachings of people like Heidi Baker, Bill Johnson, Jack Deere or C. Peter Wagner. While it might be reasonable that White is unfamiliar with Baker or Johnson (depending upon what color the sky is in his world), it’s almost unbelievable that White wouldn’t be familiar with two of the most prominent names in 20th (and 21st) century evangelicalism and – in particular – the Third Wave of the charismatic movement, Deere and Wagner. Brown was eager to nominate Baker and Johnson as two “solid” charismatics who really love Jesus and are to be recommended, but Brown continued to plead ignorance regarding Benny Hinn and other dangerous teachers (this is four years after Brown went on Hinn’s program, saying he would research Hinn and determine whether or not he was a solid teacher after the announcement of his appearance on Hinn’s program caused such an uproar). But what Chris Rosebrough pointed out on Facebook the other day demonstrates what James White seems to have forgotten about false teachers…they lie. For James White, his problem is theological because – as James says – “theology matters.” White forgets that people who teach falsely sneak in under false pretenses (2 Peter 2:1) and secretly introduce heresies (Jude 1:4), and come disguised as Christians, wolves wearing sheep’s clothing (Matthew 7:15). For James, his startlingly un-Calvinistic charitable anthropology has him ignoring what the Bible says about how false teachers teach falsely, which is by deception. John the Apostle warned, “Dear friends, do not believe every spirit, but test the spirits to see whether they are from God, because many false prophets have gone out into the world” (1 John 4:1). This warning is particularly relevant today, as Christianity is undergoing a paradigm shift of major proportions — a shift from faith to feelings; from fact to fantasy; and from reason to esoteric revelation. This paradigm shift is what I call the Counterfeit Revival. Some of the most recognizable names in the Christian community are endorsing this paradigm shift with little or no reservation. The appeal is so staggering that churches on every continent are now inviting their people to “experience” God in a brand new way. It is now estimated that seven thousand churches in England2 alone have embraced the Counterfeit Revival. And with each passing day the numbers are escalating dramatically. Sardonic laughter, spasmodic jerks, signs and wonders, super apostles and prophets, and being “slain in the spirit” are pointed to as empirical evidence of the power and presence of the Holy Spirit. The form and function of the church are being so radically rearranged that even the secular world has taken note.